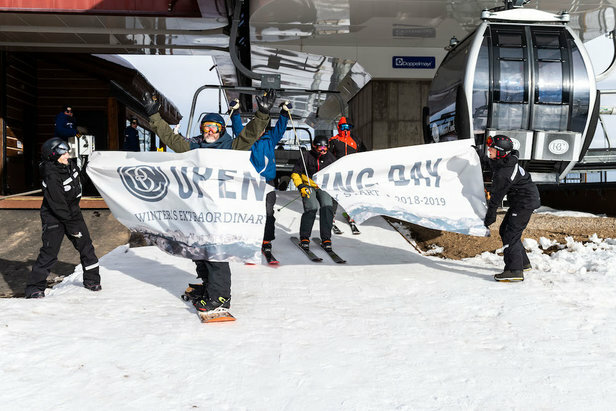 Tomer's Take for the Best Skiing This Weekend: Ski Alta or Snowbird on Friday, Jackson Hole or Big Sky on Saturday and Aspen/Snowmass, Steamboat or Wolf Creek on Sunday. The pattern remains active for the West, including California. There are two to three different storm systems lined up over the next five days. In the Northeast it starts snowy then temperatures warm over the weekend as a large storm system moves in with a sharp rain/snow line. Two to three storm systems are lined-up over the next five days. Snow levels will run high at first at Pass level then should gradually lower through the weekend. Heavy snow is likely at the Tahoe ski areas south to Mammoth. 1-3 feet of snow accumulation is likely by Monday night. Heavy valley rains are likely. One to two storm systems are lined-up over the next five days. 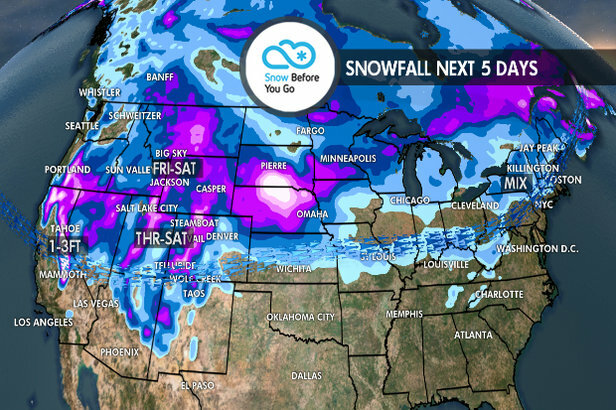 Moderate to heavy snow accumulations on Thursday, Friday and Saturday in Utah and Colorado. Alta, Snowbird, Park City, Snowbasin, Aspen, Snowmass, Steamboat, Telluride, Wolf Creek, Purgatory and Monarch are all in good position. New Mexico's best accumulations arrive Friday-Saturday. Taos and Angel Fire should have great skiing by Sunday. Another storm is possible by Tuesday. 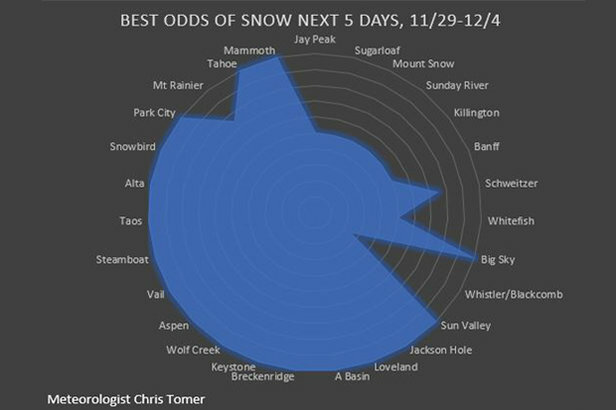 Ski Resorts with the best chances for snow through this weekend, 11.29.2018. The main storm system arrives Friday-Saturday with moderate to heavy snow accumulations. Light residual snow on Sunday. Sun Valley, Grand Targhee, Jackson Hole, Big Sky and Bridger Bowl are all in good position. Another storm system is possible Tuesday-Wednesday. Lake effect snow winds down on Wednesday and cold air settles in on Thursday. Then a warmer large storm system moves in Saturday-Sunday with wrap around snow on Monday. The precipitation on Saturday may start out as snow at the ski areas but then change to a mix, or even rain, before changing back to snow on Monday. You might want to ski on Friday and avoid the mixed precipitation over the weekend. I'm forecasting three different storm systems, but the storm track is so far south that all three storms brush the area with light to moderate snow accumulations then drop south into California over the next five days. After Wednesday there's just not a lot of additional snow with the storm track so far south. A couple of fast moving cold fronts keep light to moderate shots of snow in the forecast over the next five days.